In addition to the sword, a variety of items - such as a bow and arrow and the Hookshot - appear in The Legend of Zelda: Ocarina of Time. How did you make those? Yeah. (laughs) Even if we had an item, we wouldn’t know where to put it. We decided the number of items at the start. But that ended up causing us trouble. You had to match up with the number of items you had set at the beginning. If you just make whatever you want as you go, you’re sure to run into trouble sometime. But on the other hand, if you decide the items you’re going to put in from the start, it doesn’t mean everything will go well. I don’t think such a variety of distinctive items would have come about that way. We were making something unprecedented, so we couldn’t see what would be right to make or where the goal should be. It was unprecedented, so no one could say exactly what plan to follow. It was a mess right up to the end. We didn’t know what kind of game it was until all the parts came together. And that stuff tends to concentrate around the end of development. The script changed in one way after another...or rather, it changed drastically. How far we could adapt to those drastic changes was a way for us to show our skill. Sometimes Miyamoto-san makes drastic changes, too. I was always worried about what might come up. But I thought something like that might happen, so I prepared a tool to make such changes easier. We were making real-time in-game cut scenes, so even if the clothes or items changed, I could switch them into the scene. Back then, pre-rendered cut scenes - which were prepared ahead of time - were common, but the cut scenes in The Legend of Zelda: Ocarina of Time were rendered in real time, so the clothes or mask you were wearing at the time would show up. Right. There weren’t many problems in that regard. Miyamoto-san doesn’t really like cinematic elements anyway. This may be overstating it, but Miyamoto-san probably doesn’t need any cut scenes at all. He says they can do without them, but if we’re going to have them, he wants a way to redo them over and over. He says it’s all right to make cut scenes, but we have to be able to change them up to the day before completion. That way of thinking had been drilled into me ever since Super Mario 64, so pre-rendered cut scenes were never an option. Kawagoe-san had diligently made a way to create real-time demos, which paid off in The Legend of Zelda: Ocarina of Time. opening scene is particularly striking. How did you make that? Today, you can use a CG tool to move the camera, but back then we couldn’t do that because of how the game was constructed, so we asked to make the system to enable Nintendo 64 console to move the camera and we used that. First there was the music by (Koji) Kondo-san16, and you made the images to match that? 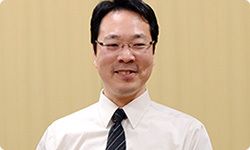 16Koji Kondo: Software Development Department, Entertainment Analysis & Development Division, Nintendo. 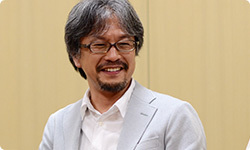 He has composed the music for the Legend of Zelda and Super Mario Bros. series. The right place for it might not exist in the game. Right. So I moved the camera around, like I was walking across the landforms on my own two feet, thinking, “Is this a good spot?” and “How about over here?” I went around looking for a place that would look good, just like searching for a location to shoot a movie. You looked for a location virtually. Right. At the beginning of the sequence, there’s a scene in which Link is riding around on his horse. I thought that spot was good and waited for a while, and then the moon slid down into view. Yeah. “That’s it!” I thought, and decided on that spot. I think a lot of chance happenings contributed to The Legend of Zelda: Ocarina of Time, but I suspect that Miyamoto-san still thinks that real-time cut scenes are easy to change.